High school basketball coaches such as Tyler Putnam of Washburn, shown here during a 2017 Class D North tournament game in Bangor, will have more space to roam the sidelines next season under new rules adopted by the National Federation of State High School Associations. 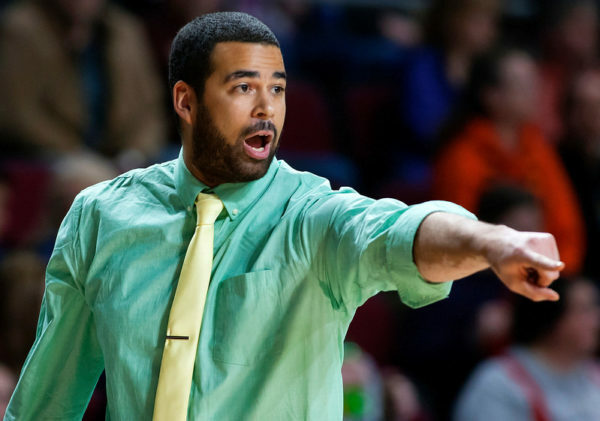 High school basketball coaches may be subject to an official warning for misconduct during games beginning next season, according to one of several rule changes recently approved by the National Federation of State High School Associations. Such warnings would be issued for matters involving the head coach or any other bench personnel that are judged not to be major, like an initial coaching-box violation, and would be recorded in the official game scorebook. Major infractions would be subject to a technical foul, regardless of whether a warning already had been issued. “Stopping play and making sure that the bench and the coach know that an official warning has been given sends a clear message to everyone in the gym and impacts the behavior of the coach, and in some cases the behavior of the opposing coach,” said Theresia Wynns, NFHS director of sports and officials and liaison to the NFHS Basketball Rules Committee, in a news release. Among other changes, the coaching box will be enlarged from 14 feet to 28 feet and bounded by a line drawn 28 feet from the end line toward the division line. A line drawn from the sideline toward the team bench becomes the end of the coaching box toward the end line. State associations may alter the length and placement of the 28-foot coaching box. The NFHS also approved a change in the way officials signal a foul against a player. After verbally informing the offender, the official shall use fingers on two hands to indicate to the scorer the number of the offender and the number of free throws. The state’s 2017 Mr. Basketball and a Bangor Daily News All-Maine first-team choice, Matt McDevitt of Greely High School in Cumberland Center, will continue his athletic and academic careers next fall at Endicott College in Beverly, Massachusetts. His decision was first reported by newenglandrecruitingreport.com. McDevitt, a 6-foot-7 guard-forward, had considered spending a year at prep school before opting to attend Endicott. The Gulls recently completed the most successful season in program history by advancing to the NCAA Division III Sweet 16 and amassing a school-record 24 victories. Endicott, a first-time at-large selection from the Commonwealth Coast Conference, became the first CCC team to reach the third round of the NCAA tourney in 21 years before falling to No. 6 Middlebury. It marked the third straight NCAA tourney appearance for 24-7 Endicott, which was ranked 19th nationally in the final D3hoops.com poll of the year, the highest ranking in team history. McDevitt averaged 16 points, 3.2 assists and 6.6 rebounds as a senior while leading Greely to a 22-0 record and the program’s first state championship in 19 years. He also was named a Western Maine Conference first-team all-star. A four-year varsity player and three-year starter, McDevitt led the Rangers to a 68-16 record during his career and surpassed 1,000 career points during his team’s Class A state-championship game victory over Messalonskee of Oakland.